This meal was inspired by my colleague, Maxine, who has orders this salad regularly from a local diner (wisely with extra feta cheese). You can only look at this salad so many times before you cave in and order (or rather, make) it yourself. Greek village-style salads are not your typical lettuce salads. They omit the lettuce altogether and consist of large chunks of vegetables. 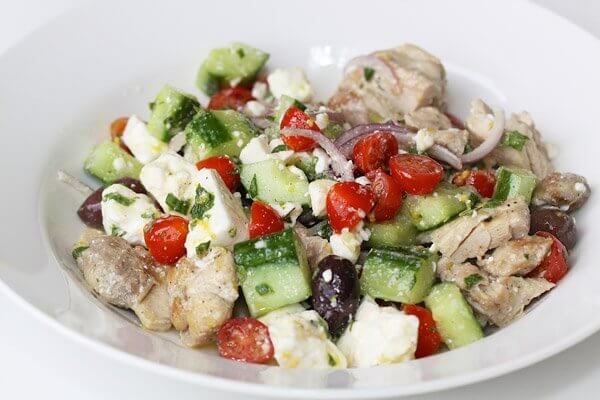 This simple but extremely delicious salad combines chunky cucumber, cherry tomatoes, big chunks of feta cheese, red onion, kalamata olives and diced grilled chicken. The dressing is a vinaigrette that combines lemon juice, lemon zest, chopped mint, minced garlic, olive oil, salt and pepper. While you could serve this as a starter, I think it’s best served in large portions as a meal… either lunch or dinner. With the chicken and a generous amount of feta cheese, it’s surprisingly filling even for large eaters.